What Kind of Cancer Affects the Small Intestine? What Are the Risk Factors for Cancer of the Small Intestine? What Are Small Intestine Cancer Symptoms? How Do Medical Professionals Diagnose Small Intestine Cancer? What Is the Treatment for Small Intestine Cancer? What Is the Small Intestine Cancer Prognosis? How Do You Prevent Small Intestine Cancer? 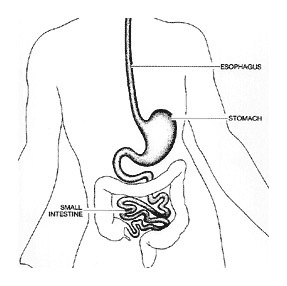 The small intestine, or small bowel, lies between the stomach and the colon. The small intestine is about 6 m (20 ft) long. Its primary function is to digest and absorb nutrients. The small intestine makes up more than 70% of the length and 90% of the surface area ofthe gastrointestinal (GI) tract. The most common cancerous (malignant) tumors of the small bowel include adenocarcinoma, lymphoma, sarcoma, and carcinoids. In industrialized countries, adenocarcinomas occur most often. In developing countries, lymphomas are more common. All these tumors have the potential to invade the bowel wall, spread into adjoining lymph nodes, and move to distant organs (metastasize). It has been proposed that the liquid nature of the small intestinal contents may be less irritating to the mucosa, the innermost lining of the small bowel. Rapid transit time in the small bowel may reduce exposure of the intestinal wall to cancer-inducing agents found in the intestinal contents. Crohn's disease - An inflammatory disease of the small intestine. Crohn disease usually occurs in the lower part of the small intestine, called the ileum. The inflammation extends deep into the lining of the affected organ, causing pain and making the intestines empty frequently, resulting in diarrhea. Familial polyposis syndromes - A group of inherited diseases in which small growths develop in the intestinal tract. In the case of familial adenomatous polyposis, while most polyps and later cancers appear in the large intestine, cancers arising in the small intestine do occur and are often found at the beginning of the small intestine in the duodenum. Associated fistulous disease: A fistula is an abnormal connection that passes from one surface to another, such as fromthe colon to the skin. The risk of developing small intestinal cancer is 6 times greater for people with Crohn disease compared to the general population. Lymphoma of the small intestine is associated with celiac disease but is also strongly associated with weakened immune systems such as occurs with AIDS. Visible blood loss:Blood or a material that looks like coffee grounds may be vomited, or black stools may be passed. Severe nausea and vomiting because of a blockage inthe small bowel by the enlarging cancer: Doctors frequently diagnose small intestine cancer during surgery for unexplained bowel obstruction. Jaundice (yellowish skin): This is a symptom in people with cancerthat involvesthe upper small intestine because of blockage of the bile ducts, which drain the liver, where they enter the small intestine. In almost all cases, doctors first choose to perform a barium contrast study ofthe small intestine. Upper GI tract endoscopy may be useful in detecting areas of concern in the immediate upper GI tract. A CT scan of the abdomen or an abdominal ultrasound may help to visualize bulky tumors and to rule out any spread of the cancer to adjacent lymph nodes and distant organs such as the liver. Colonoscopy may help diagnose tumors involving the lower areas of the small bowel. Surgical removal is the primary treatment for cancer of the small intestine. Chemotherapy or radiation therapy may be useful if the cancer is widespread. Advanced or widespread small intestine cancer is uncommon and a subject of ongoing research. Clinical trial participation is encouraged for such patients. Radiation therapy may also be helpful if the disease is widespread or if local tumors come back. Surgery may also relieve symptoms when the cancer has caused a bowel obstruction. In this case, doctors may perform a bypass procedure or limited tumor removal. The survival for resectable small bowel adenocarcinoma is only 20%. A majority of people who have adenocarcinoma of the small bowel live past 5 years. The survival chances are better if the cancer is limited to the inner walls of the small intestine and the lymph nodes are not involved. The chance of recovery is better still in people who have a carcinoid tumor which is a slower growing form of cancer. The survival rate for resectable sarcoma of the smooth muscle of the small intestine called leiomyosarcoma is 50%. Non-Hodgkin's lymphoma of the small bowel tends to respond better to chemotherapy than do other types of small intestinal cancer. Survival varies with the subtypes of the lymphoma and other areas found to be involved when lymphoma is diagnosed. The prognosis is poor, however, if a person has a small bowel lymphoma underlying celiac disease or if the person'simmune system is weakened. The association of small bowel cancer with underlying conditions makes it possible to identify populations at risk and to develop screening programs. People with a family history of polyp syndromes, such as Peutz-Jeghers and Gardner syndrome, may benefit from regular screening using upper GI tract barium studies. People with celiac disease are at higher risk of developing both adenocarcinoma and lymphoma of the small bowel. They need to maintain a gluten-free diet. People with celiac disease who also have new onset weight loss, diarrhea, or abdominal pain need immediate medical attention, including possible CT scan of the abdomen and barium study of the small bowel to rule out cancer. People with Crohn's disease and small bowel bypass procedures also require immediate attention. Crohn's disease - related adenocarcinoma frequently develops in the lower end of the small bowel, making colonoscopy a potentially useful screening tool. The small intestine is positioned between the stomach and the colon and is responsible for food absorption. "Epidemiology, clinical features, and types of small bowel neoplasms"
What symptoms did you experience with your cancer of the small intestine? What treatment did you receive for your cancer of the small intestine?